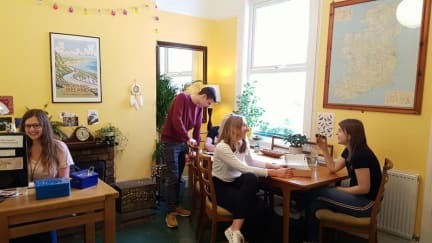 Botanical Backpackers i Belfast, Nord-Irland: Bestill nå! We have free WIFI and a free hostel breakfast (see photos) with vegan options. We have a fantastic and well-equipped kitchen, a cosy living room, and a small garden for guests to enjoy. This is an environmentally friendly establishment. Feel free to enjoy our guitars, board games, and book collection! No curfew or lockout. Our friendly staff will do their best to make you feel right at home. Feel free to ask for any information about tours, travelling, and the local area. Botanical Backpackers is the ideal base from which to explore the city, and all its culture and events. We are very happy to organise tours of Belfast and Giants Causeway from the hostel for you, and have lots of info and advice!! and the University Lanyon Building. Only 10-15 min walk from the City Hall and a 5-10 min walk to bus/train stations. Black Taxi Tours: Run from the hostel. An informative tour which takes you to see the Peace Wall, both Catholic and Protestant murals of Belfast, the Titanic shipyard and slipway, the museum district and much more. Giants Causeway Day Tours: Pick-up from the hostel. Tour includes a trip along the North East Coastline through the 9 Glens, stops at the Carrick a Rede rope bridge, Dark Hedges, and Giants Causeway. We can book this tour for you, at a special rate.